Complete Dive Map Tool: Fully interactive clickable maps and sections of topographical maps including the most interesting dive spots in the lake. With plenty of images of the different dive sites (some in open air, taken when the lake was drained). A must for planning your next dive! Characteristics: The lake is a reservoir which was build during 1956-57 and filled up completely in 1960. Maximum depth: 32 m (but varying) in the permitted zone. Visibility: 2-4 m (exceptionally up to 8 m). Best from may to july. After long rain periodes or the algae bloom due to hot summers the visibility can alter to less then 1 m, then diving becomes very dangerous. Notice: The zone 1, where all watersports activities are forbidden begins at the end of the village Lultzhausen, direction to the dam. Check the reference-boads on site. Main site: The village Lultzhausen. Heated dressing-rooms and showers are in the farm-house "Ferme Wealer" in Lultzhausen, in front of the floating bridge. The access facilities in Lultzhausen are restricted, you have to park your car on the parking areas down in the village or on the main street above the village. Only down/uploading is allowed near the farm-house. There are many easy accesses for divers to the water. Other dive-sites on the lake: From Insenborn, the village just near Lultzhausen. Follow the road down to the water. The two parking areas at the end are very close to the water. Another nice place to dive is further from the village Bonnal where you follow the road allong the bank to a nice meadow directly at the water called "Fuussekaul". The village Liefrange on the other side, across the water of Lultzhausen offers maybe the most interesting dive sites. Notice: In the summer there are a lot of tourists lying on the bank. What can you see underwater: Training platforms in 5, 10, 15 and 20 m depth at the right side of the floating bridge in Lultzhausen. Stone bridges in Lultzhausen, Insenborn and Liefrange. 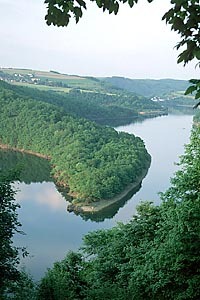 Ruins in Lultzhausen and Liefrange. Impressive walls everywere. Mostly mud on the ground. Tank filling: You can fill up your tanks at the Hotel/Restaurant Peiffer in Insenborn, both air and Nitrox. Notice that on Thurdays they are closed except when there is a public holiday in Luxembourg. Two more filling stations (coin-operated machines at 200 bar) are located in Lultzhausen, one at the rescue centre and the other at the lake side of the youth hostel. When the lake was drained: The lake has been drained in 1991 to repair the dam which is located in Esch-sur-Sûre. More details for this period.